I hope that you are all having a good day even though where I am is grey :-(. 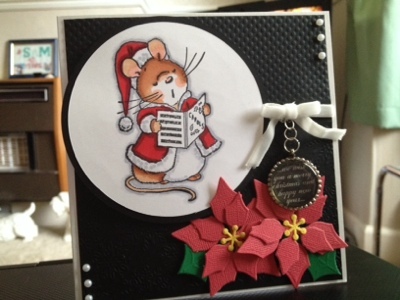 I have made yet another card for the crafter's companion uk challenge. If you get chosen you become a guest designer for 3 months. And I would so love to win as I love crafter's companion. On this card I have used white centura pearlised card. I used the 6x6 Christmas elegance embossilicious embossing folder onto black card. I used the white velvet ribbon and white gems which came from the fluff & stuff in the Frou Frou range. I stamped the image (Makey Bakey Christmas Carols)and sentiment onto Neenah card stock. I put the sentiment into my epiphany tool and put an epoxy circle sticker onto it and put it in a circle metal holder, and I added a few jump rings. And I also used the crafts too ponsietta die and I used core'dinations card. Really cute image, lovely card - love the hanging sentiment!! o this is so cute and wonderful card Sam. Such a cute image and a wonderful Christmas card. How cute! Love those poinsettias. The image is so cute and your card is lovely.